Dave Danforth (1890-1970) is one of the most fascinating and controversial figures in the history of the national pastime. He was “the icicle of the swirling vortex” for most of his career, and the mystery of what he threw and how he pitched has never been resolved.1 “Danforth, if you believe the boys in the dugout, did everything to the ball.”2 Over the course of a career that stretched from 1911 to 1932, he kept overcoming adversity. As J. Roy Stockton wrote, “It is doubtful if ever a professional athlete has encountered circumstances so discouraging as those which Dave Danforth has had to hurdle in the course of his baseball career.”3 Dave also had a remarkable knack for being involved in many significant baseball events, a Forrest Gump of the game. Dave was a pitcher from his early days. He explained why: He was the biggest kid in the neighborhood and simply told the others that he would pitch—or there would be no game.7 He pitched in high school and at Baylor University, which he attended for two years. His second year, 1910-1911 he had a perfect 10-0 mark—including a no-hitter—and led the school to the Texas Collegiate Championship. Dave was a tall, slender southpaw (listed at 6 feet, 167 pounds) who had caught the eye of one of Connie Mack’s informal scouts, Hyman Pearlstone, a grocer and banker from Palestine, Texas. He promised Dave a $500 signing bonus if he joined the Athletics. Dave made the trip to Philadelphia and showed up at Shibe Park early on the morning of August 1, 1911. That afternoon, manager Connie Mack inserted Dave into the game in relief against the first-place Detroit Tigers. Danforth was not eligible for the World Series, but as was not unusual with Mack’s s sharing club, he was awarded a full winner’s share of $3,654.58, at the age of 21. Jack Dunn provided Dave with a private room for his studies at spring training in Fayetteville, North Carolina, and the dental school’s dean allowed Dave to miss many of his classes and get lecture notes from a classmate. In the meantime Danforth started slowly but soon took his game to another level. He began experimenting with different pitches. When he struck out 11 men in relief on August 6, the Louisville Courier was surprisingly forthright in its description of the home-team pitcher: “He kept scratching the ball and roughing the surface until the visitors kicked about it.”17 Dave’s most effective pitch was one for which he became famous, as the Father of the Shine Ball. Danforth explained how he stumbled upon the pitch, with two slightly varying accounts. The dusty field in hot and dry Louisville was regularly sprayed with oil, to keep the dirt from swirling. But the oily ball was hard to grip. According to one version, Dave would rub the oily ball on his pant leg. Under the other story, he would put rosin on his pants leg and rub the ball on it.18 In both accounts, in attempting to remove the oil, he made one side of the ball smoother and darker; hence “the shine”. Danforth said he got the idea by watching a bootblack shine shoes with a rag. The result of the contrasting surfaces of the ball (smoother and rougher sides) was similar to many trick pitches: a ball with an unpredictable flight, one it was hard to make contact with. Chicago White Sox secretary Harry Grabiner saw Danforth pitch that month, and on September 28, 1915, after Dave won 12 games for Louisville, the White Sox drafted him. Dave Danforth was coming back to the majors. Often the inventor of something is not the one who maximizes its use, whether in baseball or another endeavor. Elmer Stricklett (career record of 35-51) was one of the pitchers credited with introducing the spitball in the majors, yet his teammate and disciple, Ed Walsh, rode it to fame. In Chicago, Danforth showed the shine ball to a journeyman pitcher by the name of Eddie Cicotte. Up until 1915, Eddie had a record of 91-81; after that 13-12 season, he fashioned a 105-55 mark and became one of the game’s best pitchers. F. C. Lane, the editor of Baseball magazine, said that Lefty Williams, Cicotte’s teammate, told him that Dave did indeed teach the shine ball to Cicotte.22 During that 1916 spring training, Dave befriended another pitcher who would later ride the shine ball to fame: Hod Eller.23 Eller did not make the 1916 White Sox (he would spend the season in Moline), but would be one of the aces of the 1919 world champion Cincinnati Reds. Danforth’s 1916 season was fairly ordinary. He appeared in 28 games, 20 of them in relief, with a 6-5 record and a 3.27 earned-run average. With all the controversy swirling around him, teammate Eddie Collins dubbed him “Dauntless Dave.” His White Sox were improving dramatically. After they won 70 games in 1914, new manager Clarence “Pants” Rowland led them to 93 wins in 1915 and 89 in 1916, when they fell just two games short of the pennant. The 1917 White Sox put it all together. With 100 wins, they won the pennant and beat the New York Giants in the World Series. One of the tools that Rowland employed was the relief pitcher, and Dave Danforth was his man. Dave appeared in 50 games (only 9 starts), 26 finishes, and 9 saves (as computed retroactively), all league-leading numbers. Also typical were a couple of August incidents. Cleveland manager Lee Fohl declared that if the White Sox won the pennant, they would do so by “unfair tactics,” referring to Danforth’s pitching.38 When Dave pitched six innings of one-run relief to nail down an 8-3 win over the Yankees, they accused him of tossing an emery ball. On August 14, in the second game of a doubleheader, the first pitch Danforth threw in relief hit Cleveland star outfielder Tris Speaker in the right temple and knocked him unconscious for a few minutes. The team doctor said that had the pitch hit an inch lower, “it might have been all up with Spoke.”40 The resultant concussion and blurred vision kept Speaker out of the next seven games. After the incident, he did not speak out against Dave for deliberately throwing a beanball (which he would do three years later when Carl Mays hit Ray Chapman). But Speaker spoke out against the “sailer,” saying that it was time to “call a halt before batting becomes a lost art.”41 He singled out two White Sox hurlers. “The game will go to the dogs unless a stop is put to the doctoring of the ball by [Eddie] Cicotte and Danforth. . . If the Sox win, that is what will give them the pennant.”42 Speaker’s manager was Lee Fohl, who showed a reporter a Danforth-thrown ball, one that had a waxy substance which raised the seams.43 Five years later, Fohl would become Dave’s manager in St. Louis. The White Sox won four games from the Tigers—two doubleheaders on September 2 and 3, 1917—that would be the focus of a major controversy almost a decade later. Chicago entered the games with a 3 ½ game lead over Boston, which they would stretch to seven games two days later. In late 1926, banned Black Sox player Swede Risberg charged that the Tigers deliberately lost those games and that he helped gather the payoff money that most of the White Sox players —including men considered above reproach, such as Eddie Collins and Ray Schalk--contributed. (The Tigers committed nine errors in those games.) When confronted with the undeniable evidence that they did pay the money, the Chicago players said the money was paid to the Tigers as a token of thanks for their beating the Boston Red Sox three times later that month, September 19-20. Commissioner Kenesaw M. Landis did not take any action against the White Sox, other than banning the paying of such “Thank You” money from that point forward. 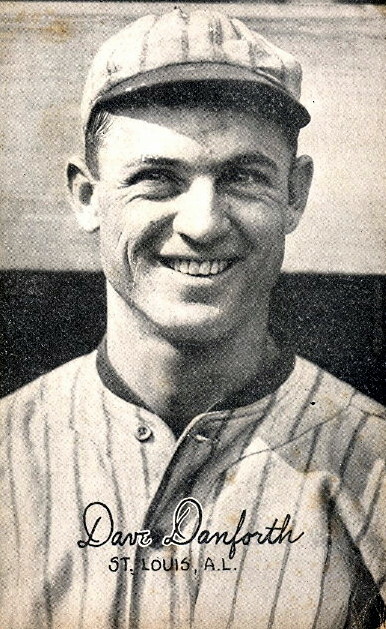 Dave appeared in only one game of the 1917 World Series against the New York Giants. White Sox starters pitched complete games in the first three contests, two of which Chicago won. They were losing Game Four, 3-0, when Dave took over in the eighth inning. He gave up a single to Buck Herzog and a home run to Bennie Kauff. Heinie Zimmerman then tripled but was thrown out trying to steal home, and the Giants won, 5-0. The White Sox then won the fifth game, remembered for Zimmerman’s chase of Eddie Collins. Chicago used four pitchers—but not Dave. A complete-game win by the White Sox’ Red Faber in Game Six won the Series. Spring training of 1918 was marked by controversy when the respected black trainer of the White Sox, William “Doc” Buckner, was released. The Chicago Defender, the city’s black paper, demanded to know the reason and wondered if Rowland really was running the team “or are some of those southern crackers on the team running it?”46 Chicago sportswriter I. E. Sanborn suggested Dave Danforth was involved. More than five years later, respected Detroit sportswriter H. G. Salsinger elaborated. That spring, Dave had “borrowed” Doc’s sharp scalpel to whittle a piece of wood. When Buckner called Dave down for taking his tool, wrote Salsinger, Dave went after Buckner with a baseball bat.47 Doc Buckner would return to the White Sox in 1920, after Dave had left the team. Neither Dave nor the White Sox came close to replicating their season in 1918. Dave’s record went from 11-6 to 6-15, with only two saves and a jump of 0.78 in his earned run average. The Sox won less than half of their games and fell to sixth place. Dave did improve in one area: he showed more durability, completing five of the 11 games he started (only one of nine in 1917). America’s entry into the Great War in 1917 did not have a major impact on American society until the following year. The 1918 major-league season ended a month early as young men from all walks of life were being drafted and sent to Europe. It was not surprising that Dave was not drafted. Not only was he married, but he was supporting his widowed mother (who was living with his family) and his first child, Dorothy, who was born in 1917. While the White Sox bounced back in 1919, Danforth did not. Hampered by arm trouble, he won only one game, and his earned-run average ballooned to 7.78. On April 25, Dave was shelled by the Browns and didn’t survive the second inning. His July 12 performance epitomized the kind of season he had. He relieved Dickey Kerr in the third inning of a game against the Red Sox. The first pitch he threw was a ball that Babe Ruth knocked out of the park, his first Comiskey Park home run ever.51 Dave went on to give up eight more runs in the game. On August 26 the White Sox traded him to Columbus of the American Association (which league he had pitched in from 1914 to 1916) in exchange for pitcher Roy Wilkinson.52 Dave brought an action against the White Sox for a World Series share to the National Commission and eventually did receive a one-quarter share.53 One is left to wonder what role, if any, he would have played in the Black Sox scandal. While the Senators were a very bad team again in 1921—they won only 66 games—Danforth won 25 of them (tied for the league lead in wins). He also led the American Association in strikeouts with 204, earned run average with a 2.66 mark, and complete games, with 35.63 His spectacular season would propel him to the major leagues for the third time. Again, Dave’s work was marked by accusations; it was now that the Columbus Dispatch called him “the icicle of the swirling vortex.”64 Early in the season, his former manager Clymer, now with Toledo, accused Dave of throwing the emery ball and doctoring the ball with his fingernail.65 The “icicle” responded by beating Toledo three times in eight days, by scores of 2-1, 3-0, and 2-0. Evans’s role in the Danforth controversy over the years is fascinating. The respected Hall of Fame umpire was one of the few arbiters of the game who felt Dave was not tampering with the ball. He was also the only umpire who occasionally spoke out on Dave’s behalf. When Danforth joined the White Sox, Evans had been fascinated by his “newfangled mystery ball.”79 Before the deal with Columbus, Evans had assured Bob Quinn that Dave’s delivery was clean.80 In early July 1922, Evans commented on Danforth’s “heart,” for having the fortitude to keep coming back in the face of constant accusations.81 In one of his columns, Evans listed all the things Dave had been accused of doing—from loading the seams to loosening the cover to roughening the ball with his fingernail—and then declared, “None of these things were ever proved.”82 His use of the “Dauntless Dave” moniker certainly seemed appropriate. The Oilers then met the Mobile Bears of the Southern Association for the Class A championship. In Game Four, a victory for Dave, more than 25 balls were removed from play, as Mobile protested. The Tulsa World said, “The fact that the ball was faulty does not mean that Danforth had made it so.”89 Dave also won Game Six with a shutout, and the championship belonged to Tulsa. A pall was cast over the Browns’ 1923 season when George Sisler was forced to sit out the year, with a serious eye injury. Danforth became a mainstay of the Browns’ pitching staff, along with Urban Shocker and Elam Vangilder. This would be the first of three seasons in which he would appear in an average of 39 games and toss more than 200 innings a year. Controversy still shadowed Danforth. The season started with Ty Cobb again protesting his delivery on April 18, and a suspicious ball was forwarded to league President Ban Johnson.91 Still Dave persevered, and on April 29 he pitched one of his finest games in the major leagues. He dropped a 1-0 game to those same Tigers (Cobb was hitless), giving up the lone run in the ninth inning. Keener weighed in on the controversy. “I know the character of Lee Fohl. He would give a friend the last dime he had in the world. . . . If Lee wouldn’t sign [the petition] there must be some black smoke in the air.”98 When the dust settled a few days later, Fohl had been fired by a furious owner. Phil Ball felt he had gone to great lengths and cost to secure Dave, only to be undercut by a manager who refused to use the talent he was provided. On August 16, 1923, with both Ban Johnson and Commissioner Kenesaw Mountain Landis in the stands, Dave returned to the mound. He was facing the league-leading Yankees in St. Louis. He understood that his career would end if he resorted to trick pitches. With Billy Evans behind the plate, Dave decided to remove any suspicions by constantly asking for a new baseball, whenever the ball became discolored or marked up in any way. An incredible 58 balls were put in play, and still Dave was effective. He threw a three-hitter, though the Yankees’ Herb Pennock was better yet, and the Yankees came out on top, 3-1. If only it were so easy . . . When Dave three-hit the Tigers on July 6, he had to do it with Ty Cobb constantly heckling and accusing him of pitching illegally. At that point in the season, Danforth’s record stood at 10-4. He cooled off from then on, finishing at 15-12. On August 5 he and Urban Shocker swept a pair of games against Washington to draw the Browns within four games of first place, though fourth place was where they would finish the season. Danforth’s final season in the major leagues was 1925. He held out and signed a contract for the same amount of money he got in 1925, $6,500.107 His record was a pedestrian 7-9, and he led the league in giving up home runs, with 19. On May 6 he gave up a home run to his nemesis, Ty Cobb, one of five Cobb hit in two consecutive games in St. Louis. The Pelicans were swept in the Dixie Series by Wichita Falls of the Texas League, in four straight games. Dave pitched well but lost two of the games, as the Pelicans generated little offense. In 1928, neither Danforth nor the Pelicans could replicate their 1927 performances. Dave fashioned a 10-11 record, and his earned-run average more than doubled to 4.71. Somewhat surprisingly, he was named to the league’s all-star team. The Pelicans finished in third place. In 1929 Dave bounced back (8-7, 3.39), but the 38-year-old missed three weeks in August with a strained back. Dave did not attend professional baseball games, despite receiving a lifetime pass from the Orioles.132 He enjoyed golf, fishing, and gardening. He suffered from Alzheimer’s disease the end of his life and died at the age of 80 on September 19, 1970 in Baltimore. While an abrasive fingernail or skin probably falls under “other substance” mentioned above, what about powerful hands? Even if it does not, the end of this rule states that the pitcher is held responsible even if the umpire cannot determine who defaced the ball. 1 Columbus Dispatch, June 2, 1921. 2 Hugh Bradley, “Freak Pitching Deliveries—Past and Present,” Baseball magazine, June 1936. 3 St. Louis Post-Dispatch, August 19, 1923. 4 In the 1880 census, Charles is listed as a farmer. Henrietta and her parents were born in Germany, as listed in the 1890 Census. 5 Listed in the 1880 Census as Prussia. 6 Email from Lajuna Danforth Carabasi, Dave’s niece, to the author, dated April 5, 2011. 8 Atlanta Constitution, August 9, 1911. 9 Washington Post, August 10, 1911; Charlotte Observer, September 6, 1911. 10 The Sporting News, May 16, 1912. 11 Philadelphia Evening Ledger, August 31, 1917; Lexington Herald, October 18, 1917. 12 Hall of Fame contract card suggests it was an outright sale in May, but Baltimore accounts suggest Connie didn’t give up his claim to Dave until that August deal, Most reports said Mack gave up Claud Derrick and Bris Lord, and cash for Walsh and Murphy. 13 Shawkey led the way with 17 wins; Dave won 12 games. Vickers won 13; he had won 57 games for the 1910-1911 Orioles. 14 E-mail from Jim Thompson to author. 15 Hall of Fame contract card. Red Sox scout and former Red Sox manager Patsy Donovan said that he was sent to Baltimore to scout Dave and to decide whether the Red Sox should purchase him. Instead, Donovan was so impressed by Ruth and Ernie Shore that he told Boston owner Joe Lannin to buy Ruth and Shore instead. 16 Newspaper clipping, Danforth family scrapbook; Baltimore Sun, December 11, 1914. 17 Louisville Courier, August 7, 1915. 18 Danforth obituary, New York Times, September 22, 1970. 19 O’Toole was with St. Paul and set the mark against Milwaukee on July 10, 1911. There was also mention that Danforth broke Willie Mitchell’s two-game mark of 32 strikeouts, set in 1909 with San Antonio. Fort Worth Star-Telegram, October 15, 1915. 20 Some accounts say that Dave struck out 16 in that game. 21 American Association historian Marshall Wright confirms these strikeout records. As stunning as was McDermott’s game, he followed it in his next four games with a string of 19, 18, 17, and 19 strikeouts. McDermott’s Wikipedia entry, http://en.wikipedia.org/wiki/Mickey_McDermott. 22 Hartford Courant, September 2, 1923. 23 New York Times, September 28, 1919. 24 “Why Dave Danforth has been a Storm Center,” Baseball magazine, July 1924. 25 Don Basenfelder manuscript, Sporting News files. 26 The Sporting News, April 20, 1916. 27 Baltimore Sun, December 20, 1915. 28 The Sporting News, October 7, 1915. In the next few years, there would be much debate over the shine ball, with many suggesting it didn’t really exist, that Eddie Cicotte simply led people to believe he was doing something with the ball. The Minneapolis players were spot-on with their analysis. 29 Daily Morning Oregonian, April 27, 1917. 30 The Sporting News, April 20, 1916. 31 New York Evening Journal, January 23, 1924. 32 Dave did not say what year he learned the move. It could have been during his brief stint with the Athletics. More likely, he was referring to a pitcher on the American Association’s Cleveland franchise, known as the Bearcats in 1914 and the Spiders in 1915. 33 Don Basenfelder manuscript, Sporting News files. 34 Newspaper clipping, Danforth family scrapbook. 35 Wilkes-Barre Times-Leader, January 19, 1922. 36 Dave was called for a balk 13 times in his major-league career, with seven of them in 1922-1923. 37 J. Roy Stockton, St. Louis Post-Dispatch, undated 1917 newspaper clipping, Danforth family scrapbook. 38 Wilkes-Barre Times-Leader, August 14, 1917. 39 New York American, July 31, 1917. 40 Charles Alexander, Spoke. p. 121. Dave was not known as a “headhunter.” He hit only three batsmen in 1916, and the same number in 1917. Carl Mays hit 9 and 14, respectively, those years. 41 Ibid. While a “sailer” was assumed to have resulted from doctoring the ball in this era, former major-league pitcher Dave Baldwin explained to the author that this effect is generated nowadays from the cut fastball (gripped slightly off-center). E-mail to the author, March 31, 2011. 42 New York Tribune, August 26, 1917. 44 Danforth pitched briefly in three of the games. In two, he snuffed out rallies and was pulled for pinch hitters in the bottom of the first inning in which he appeared. In the third game, he was not as effective. 45 Daily Boston Globe, January 2, 1927. 46 Chicago Defender, March 23, 1918. 47 Washington Post, September 19, 1923. Salsinger brought this up after Dave was the center of another controversy, one that had cost his manager his job. 48 Fort Wayne News-Sentinel, May 7, 1918. In his first two seasons with Chicago, 1916-1917, Williams started 55 games and finished only 18, a completion rate below those of the average starter in those seasons, which was slightly more than 50 percent. 49 Washington Post, May 17, 1918. Three years later, Griffith would offer $50,000 in an unsuccessful attempt to acquire Dave. Washington Post, December 9, 1921. 50 The Baltimore Evening Sun gave good accounts of the Dry Docks of 1918-1919. 51 It was Ruth’s 11th home run of 1919 and the 31st of his career. 52 Wilkinson had won 17 games with a 2.08 earned run average for Columbus. He would win only 12 games in the majors, and had a 4-20 record for the 1921 White Sox. The Chicago Daily Journal noted that the White Sox also included cash in the deal, a reflection of how far Danforth’s stock had fallen. August 26, 1919. 53 E-mail from historian Gene Carney to the author, dated October 22, 2003. 54 Danforth’s Hall of Fame contract card shows that he was suspended for this action and later reinstated, when the 1920 season approached. The International League champions did not play the American Association champion in the Little World Series that year. Instead, the AA’s St. Paul Saints met the Pacific Coast League champion, and the Orioles were available to play the Dry Docks. 55 Newspaper clipping, Danforth family scrapbook. Jack Dunn was close to Joe Tinker, which probably explains the latter’s granting Dave clearance to play. 56 Baltimore Evening Sun, September 26, 1919. 58 Daily Morning Oregonian, March 14, 1920. 59 Kansas City Times, July 2, 1920; Columbus Dispatch, September 14, 1920. Each infraction resulted in an automatic ten-day suspension. 60 Kansas City Times, September 14, 1920. 61 Newspaper clipping, Danforth family scrapbook. 62 Columbus Dispatch, December 11-12, 1920. 63 Danforth’s league-leading figures for 1920 (strikeouts) and 1921 are from The Encyclopedia of Minor League Baseball, Third Edition, edited by Lloyd Johnson and Miles Wolff. 64 Columbus Dispatch, June 2, 1921. 65 Ohio State Journal (Columbus, Ohio), May 1, 1921. 66 By now, Joe Tinker had sold his interest in the team and moved with his sick wife to Florida. The American Association was also one of the minor leagues that had “opted out” of the draft. This was an excellent example of why they did so: Rather than lose a star like Dave in the draft for a nominal fee, they could wheel and deal with a number of clubs and extract a higher price or a number of players. 67 New York Herald, December 15, 1921. 68 St. Louis Times, March 15, 1922; Columbus Dispatch, December 15, 1921. 69 Newspaper clipping, Dave Danforth scrapbook. 70 For example, Grover Lowdermilk had pitched in the major leagues for parts of nine seasons and was currently on the Minneapolis roster. Emilio Palmero had pitched briefly for the Browns in 1921 and was recalled from Louisville. 71 Columbus Dispatch, January 1, 1922. 72 St. Louis Times, December 15, 1921. 73 New York American, December 15, 1921. 74 George Robinson, “Dave Danforth, Devious Dentist,” unpublished paper, April 2011. 75 Since there was no cash involved, there would have had to be a cash figure assigned to the players’ values. There were reports that the deal would have translated to a cash value of $75,000-$90,000, which seems high. Since St. Louis and not Columbus needed to mollify Danforth (the latter already had their deal, regardless of whether Dave would report), it is likely a compromise figure was reached and paid by the Browns. 76 Mobile Register, March 19, 1922. 77 Kansas City Star, April 26, 1922; New York Globe and Commercial Advertiser, April 28, 1922. The Tigers had been tipped off by veteran White Sox catcher Billy Sullivan, who was now a Detroit coach. Sullivan had observed Dave while playing for the Minneapolis Millers in 1915. Chicago Daily Tribune, April 22, 1916. See endnote 28. 78 St. Louis Globe-Democrat, June 14, 1922. 79 Morning Daily Oregonian, January 15, 1916. 80# Columbus Dispatch, January 13, 1922. 81 San Jose Evening News, July 7, 1922. 82 Newspaper clipping, Danforth family scrapbook. 83 St. Louis Times, March 4, 1922 and March 15, 1922. Apparently Danforth sought out Plank, his old Philadelphia teammate, when he returned to the major leagues in 1916. Wilkes-Barre Times-Leader, June 19, 1922. 84 St. Louis Times, May 15, 1922. The Yankees rallied to win that July 27 game in extra innings and closed to within one game of the first-place Browns. 85 Basenfelder manuscript and an undated Sporting News article, conveyed by historian Norman Macht, said that Danforth did so. Dave’s son-in-law, Jim Thompson, told the author that Dave did indeed soak his hand in brine, but not overnight. Dave’s daughter Jean Danforth Thompson said to the author he also used the fluid that is used on violin bows on his hand. Phone conversations with the author, January 6, 2002. 86 St. Louis Post-Dispatch, August 12, 1922. 87 St. Louis Post-Dispatch, August 13, 1922. 88 Tulsa World, August 27, 1922 and September 16, 1922. 89 Tulsa World, September 30, 1922. 90 Martin J. Haley, St. Louis Globe-Democrat, October 20, 1922. 91 Marc Okkonen, Ty Cobb Scrapbook, p. 172. 92 Washington Post, April 30, 1925. 93 St. Louis Times, August 3, 1923. One wonders if Keener spoke with Billy Evans and, if he did, what the umpire told him. 94 Roger Godin, The 1922 St. Louis Browns: Best of the American League’s Worst. 95 Don Basenfelder manuscript, Sporting News files. 96 “Why Dave Danforth has been a Storm Center,” Baseball magazine, July 1924. 97 St. Louis Times, August 22, 1923. 98 St. Louis Times, August 3, 1923. 99 St. Louis Globe-Democrat, August 15, 1923 and New York Times, August 15, 1923. 100 St. Louis Times, August 17, 1923. 101 “Why Dave Danforth has been a Storm Center,” Baseball magazine, July 1924. 102 Baseball magazine, October 1923. 103 Other than 1923, Dave never hit more than five batters (1918). His 12 hit batsmen would have led the National League in 1923, but Howard Ehmke and Walter Johnson hit 20 men in the American League. 104 Chicago Daily Tribune, May 31, 1924. 105 June 3, 1924 letter, American League Archives, National Baseball Hall of Fame Library. 106 New York Telegram and Evening Mail, June 9, 1924; St. Louis Post-Dispatch, June 13, 1924. 107 National Baseball Hall of Fame contract cards. This was the highest salary Dave earned. 108 “Scribbled by Scribes,” The Sporting News, July 15, 1926. 109 Milwaukee Sentinel, March 19, 1926. 110 New Orleans Times-Picayune, June 6, 1927. 111 Chicago Daily Tribune, March 24, 1944. 112 New Orleans Times-Picayune, July 2, 1927. 113 New Orleans Times-Picayune, August 29, 1927. 114 Atlanta Constitution, March 13, 1937. 115 Atlanta Constitution, December 6, 1929. Glazner had a 15-9 record for Dallas in 1929 and then went 19-8 for New Orleans in 1930. 116 Dallas News, April 15, 1930 and May 3, 1930. 117 Dallas News, July 6, 1930. 118 On May 2, 1930, a Western League game in Des Moines (played at night against Wichita) drew 12,000 fans for a team that was averaging 600. www.minorleaguebaseball.com/milb/history/timeline.jsp. 119 Buffalo Evening News, August 1, 1964. 120 Southworth was one of the toughest men to strike out in major-league baseball history. He ranks number 26 on the all-time list, whiffing only once every 29.45 at bats. www.baseball-reference.com/leaders/at_bats_per_strikeout_career.shtml. 121 Albany pitcher Cy Blanton tied the mark on September 1, 1934. New York Times, September 2, 1934. Veale set his record with the Columbus Jets, against the Buffalo Bisons. It was a 12-inning game, but Veale was removed for a pinch hitter in the tenth inning and pitched only nine innings. 122 Chattanooga Times, August 22, 1931. 123 “Returned” is the word on the Danforth transaction card at the Baseball Hall of Fame Library. 124 Telephone interview with the author, July 11, 2001. 125 There was mention that Dave joined Pine Bluff (Arkansas) of the D-level Cotton States League. Atlanta Constitution, May 22, 1932. Baseball-reference.com lists “Danforth?” on that team and lists his 1932 record as 11-5. 127 Undated Danforth letter in Danforth family scrapbook. 128 Hartford Courant, May 2, 1937, and March 16, 1938. 129 Daily Boston Globe, September 11, 1939. 130 Buffalo Evening News, August 16, 1964. 131 Letter of Dave Danforth, Mastro Auction, August 31, 2007. 132 Dave’s daughter, Elaine Danforth Harmon, was probably referring to the major-league Baltimore Orioles, who began operating there in 1954. 133 “Why Pitching is in its Infancy,” Baseball magazine, February 1926. 134 Chicago Daily Tribune, March 24, 1944. 135 “Why Dave Danforth has been a Storm Center,” Baseball magazine, July 1924. 136 Atlanta Constitution, March 31, 1940. 137 Phone conversation with the author, January 25, 2002. 139 Quoted in Journal of the American Dental Association, November, 1967. 140 Ralph McGill, Atlanta Constitution, July 17, 1931. 141 Fred Turbyville, undated Evening Star newspaper clipping in Danforth family scrapbook. Detroit sportswriter H. G. Salsinger supported this line of thinking when he wrote, “Umpires felt like resigning whenever Danforth warmed up, for it meant another tough afternoon for them.” Detroit News, April 19, 1923. 142 Tom Meany, Baseball’s Greatest Teams, p. 197.